Most people leave the tiles for last. If you’re building a new home or renovating an old pile, the big spatial considerations take precedence over the final finishes. 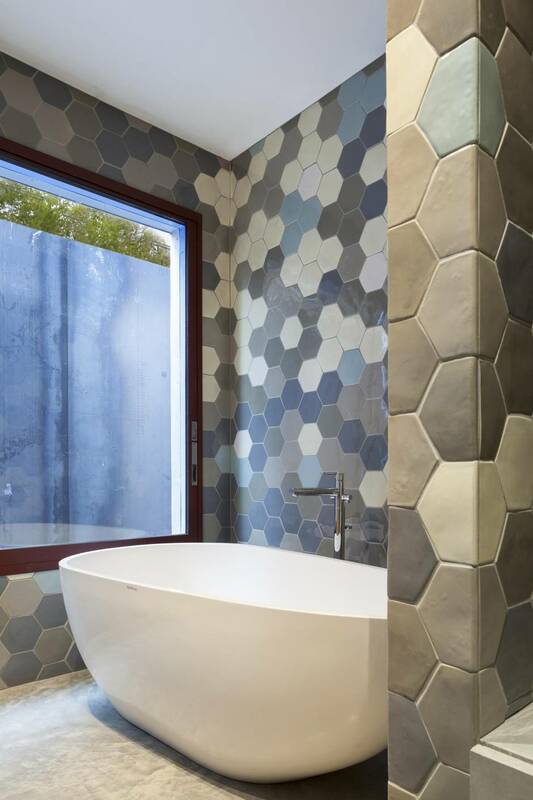 But one house in Vancouver reverses the order of things, turning the tile treatments into the main attraction. The bespoke artworks speak to the owners’ aspirations, and resonate far more deeply than any off-the-shelf motif ever could. For the new residence of architect Clinton Cuddington and his wife, Monica Berdin, design studio Dear Human crafted an assortment of murals that are as integral to the 3,300-square-foot home’s character as its modern architectural features. In the second-floor bathroom, tiles with cross-shaped decals in pinks and blues form a giant floral. 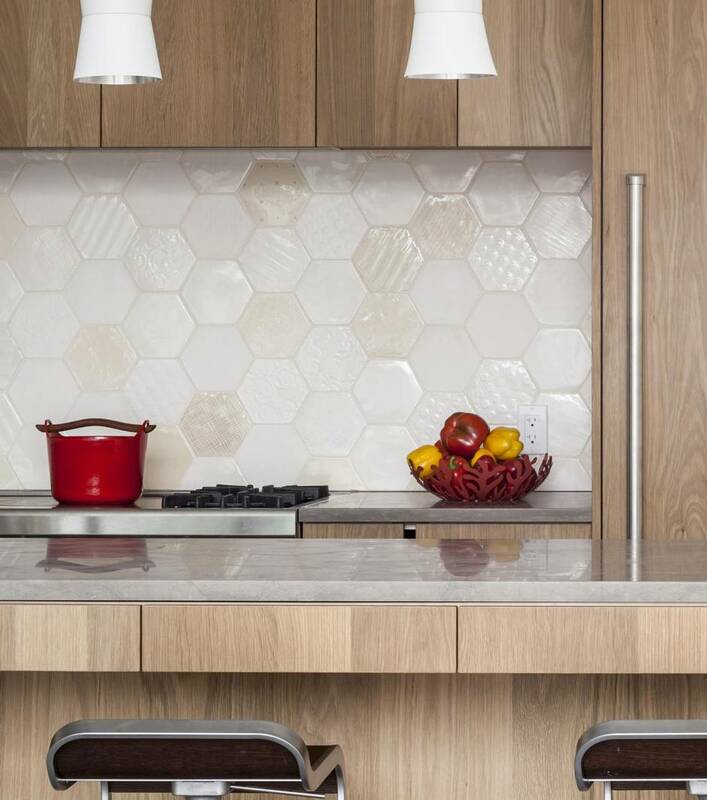 In the kitchen, a mosaic of hexagons in subtle tone and texture mutations – from raised dots to a glazed cross hatch – turns the backsplash into a serene work of art. The house is practically a case study in how an architect and an artisan can work together to thread eloquent ornamentation through a sleek and minimal sequence of spaces. Dear Human’s Noel O’Connell and Jasna Sokolovic, a husband-and-wife team, have been longtime friends and colleagues of Cuddington, who helms the architecture firm Measured Architecture with Piers Cunnington; together, they are collaborating on a public art project for a Vancouver bridge. For the past couple years, Measured has invited Dear Human to pitch tile concepts to its clients; most simply didn’t get it. But at each proposal Cuddington brimmed with enthusiasm. When he and Monica were ready to build their house, he made it clear, Dear Human’s artistic aesthetic would be a part of it. The adventure was one that artists and clients dove into with clear goals. Over a series of brainstorming dinners, Cuddington and Berdin laid out their preferences for colours, compositions and styles in Dear Human’s library of custom samples. “We needed to create good moments to convey what we wanted so that we could then step back and let the artists breathe and conjure,” Cuddington says. If you micro-manage this sort of thing, what you get in the end is an appliqué and not an installation with meaning. “They let us do our own thing,” O’Connell says with palpable appreciation. Doing their own thing entailed a cast of characters, a studio-to-factory transformation and lots of patience. While this was their biggest coup yet, O’Connell and Sokolovic know their way around a tile. The duo exhibited their Wallpapering tiles to acclaim at Ventura Lambrate during Milan design week in April, and learned how to make the ceramic variety by working with Andy Blick, a beloved local tile artist who died last August. The first thing they needed for the Cuddington-Berdin commission: a heavy-duty press. So their mechanic, who happens to have a fine arts degree, acquired a wheel-bearing one that auto-body shops use to pop out hubs. He rewelded it, and tricked it out with wheels. After a few mechanical breakdowns – one caused by the press bearing down with 11 tonnes of pressure, cracking the die, before O’Connell learned to keep it under five – they got to work. The murals are composed of two types of tile: conventional square tiles bought in bulk, and hexagons made from scratch. “There’s a dramatic difference,” O’Connell says. Commercial tile is made with dry powder clay and compressed in huge quantities; the designers used it as a cost-saving measure, an economical substrate for their cross decal, which they printed on sheets, cut out and applied to the tiles before refiring them. 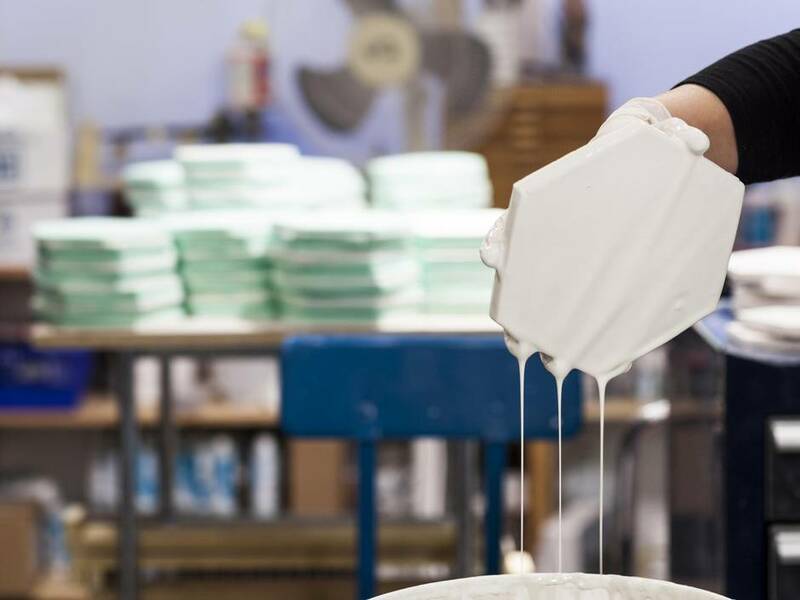 Handmade tile is produced with wet clay, cut into chunks and evenly weighed into biscuits; these discs are then pressed into the air-released die. A single tile – babysat on a drying rack, taken out and moved around, fired, glazed and fired again – takes a full week to set. The studio cranked out 50 handmade tiles a day for more than three months; from design ideation to finishing the last room, the entire project ran for a year. The handcrafted hexagonal tile has a tactile warmth – “Old World-looking, in a way,” as O’Connell puts it. That’s why it was applied to prominent areas, such as the kitchen and the master bathroom and the powder room, with its deep blue and brown clusters floating on a cream and beige background. Combining various tile surfaces, from embossed arabesques to hand-drawn polka dots, the eclectic mosaics create a homey counterpoint to the interiors’ austere surfaces: the hand-burnished concrete floors, the weathering-steel and fumed white oak staircase, and the handsome oak millwork (made by another artisan, Nico Spacecraft). All of the tiles were taped together in courses. Cameron Stewart, the tile layer, installed them with the help of a pattern printout. Even this job became creative. “He made it look nicer than we expected,” O’Connell says.